I am so excited about my soapstone and was happy to see how fantastic yours looks. So, do you like it? Has it scratched much? How often do you oil it? 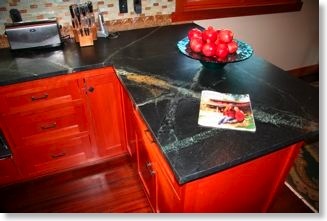 - Soapstone is non-porous which means it cannot stain and does not have to be sealed. - It won't crack if an extremely hot pot is put on it as it dissipates heat extremely well. Remember the black soapstone countertops in your Chemistry lab? - It has a matte finish. It blends in with the rest of the kitchen instead of being the center of attention. Soapstone, although very dense, is also soft to the touch (ground soapstone is talcum powder). It is soft enough that it can be scratched with a fingernail. The great part is that if it scratches, you just go get a piece of fine sandpaper or steel wool and rub it out. Soapstone may be oiled with mineral oil to deepen the grays into black and bring out any color veins in the stone. The only time I oil it is two days before a party as I hate clearing off the counters. Since soapstone is very dense it will not absorb the mineral oil, but over time and multiple applications it will form a bond with the surface. Application of the mineral oil should be done with a soft rag or paper towel. Don't apply too much! You want just enough to change the color. Let it sit overnight and then, with a clean cloth, wipe off any excess mineral oil until it is dry. So you see, to keep the oiled look it is a one to two day process. I think it looks great both ways which is why I only oil for parties. 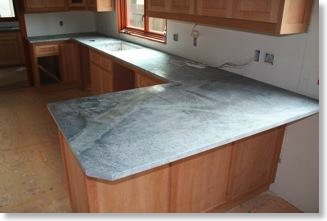 The pictures below show the soapstone just after installation. It has never had oil on it. The second picture shows the same counter only three days after oiling. It should be noted that the occasional oiling of a few times a year maintains the counter at a tone about half way between the two extremes.